A solid family needs a solid stroller. Mutsy gives you that and more in one sleek little package. 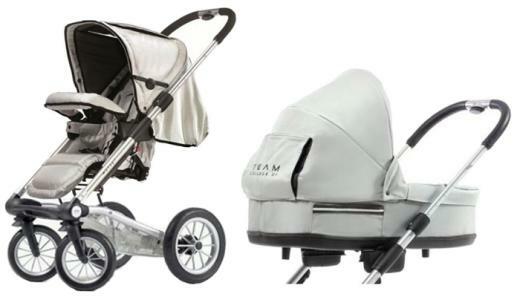 Their full size stroller, the 4 Rider, weighs just 23 pounds and is only 18″ across the frame. This little guy looks as cute as the VW bug but drives like an F-250. And that pretty much sums it up– Mutsy is a brand that has torn apart boundaries and thrives on paradox. 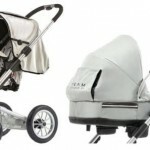 4 Rider is designed with a European pram style but also has a subtle American side that lets us go crazy. It’s heavy enough for the Brits who don’t know how to stop walking, and light enough for Americans who have just learned what walking actually is. Their appropriately named ‘Team’ line has posh fabrics but politely screams “cool parent is not an oxymoron” with adorably bright seat colors, each complete with collegiate font numbers and shades. They’re classic with a twist of cool, ultra smooth with just enough edge to make people look twice. Mutsy is perfectly comfortable for parent and child, an adjustable handle up to 44″ (!) 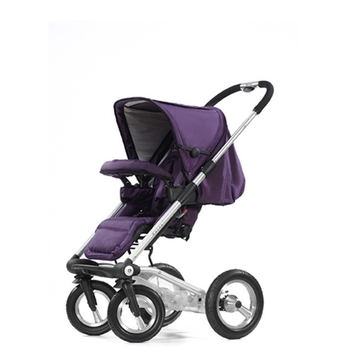 and smaller front swivel wheels make any walk enjoyable and ball bearing suspension with large five point padded harness strap will have any baby calm in seconds. Pushing the 4 Rider is always a secure experience. The stroller feels solid but has give to make sure you and baby don’t feel all the bumps along the way. Even with the handle adjusted to 44″ high, the frame will remain steady and balanced. An optional bassinet will fit a child up to six months and if you have a second there is also an optional duo seat mode so Mom can push both her babies and still use that amazingly compact frame. Other accessories include matching diaper bags, a step up board for toddlers, a fun seat with a large basket and “steering wheel”, and my personal favorite- a bouncer frame for the stroller seat. 4 Rider also has a choice to purchase the frame with lightweight foam tires or to go with single spoke air tires which are a bit heavier. Besides for it’s funky style and insane cuteness, what truly separates Mutsy from the rest? For starters, it’s the only full size stroller that can fold with the bassinet and the seat, it’s the most narrow, and it’s lighter than most as well. The wheels also come off really easily and then you have a tiny frame which is just 39.4 x 20.5 x 9.5! It also has more color and fabric lines than any full size with the possible exception of Bugaboo. It handles like a dream and will get you through any reality. This is why I love meeting people who have a Mutsy. They are all out of the box thinkers who are in love with the stroller and will gladly share their experiences with the little guy (as I have fondly come to call the 4 Rider). The quality is enduring and Mutsys have a good resale value as well. Is there anything we would change about the 4 Rider? Yes! Their next model should push itself! But all kidding aside one complaint I hear occassionally is that the basket could be bigger, otherwise this is pretty much a terrific stroller and we at Consumer Info would highly recommend it!